It’s time to step up your chips game, learn how to make homemade chips and how to add some unique flavoring. 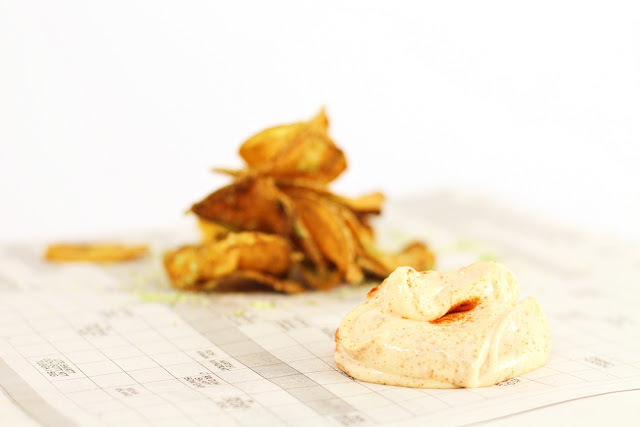 Try our recipe for homemade chips with herb salt and Sriracha dip. We all love chips right? But we usually eat them by the bag watching Netflix and then hating ourselves. 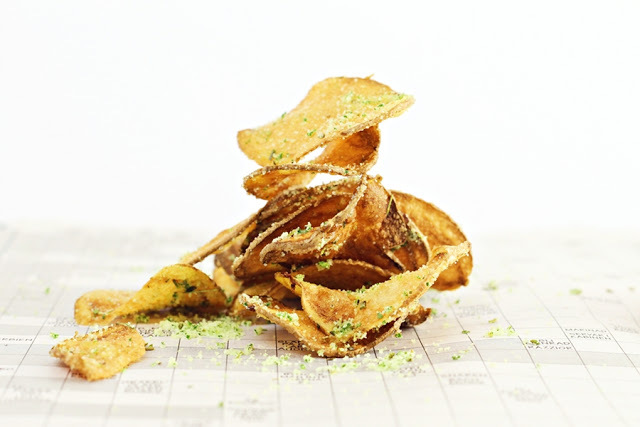 But chips can be eaten differently, like in our recipe for homemade chips with herb salt and Sriracha dip. Instead of making them by the bag we make a smaller batch. And instead of eating them on the couch in front of the game we serve them with a drink or why not a glass of Champagne. Now we are not snobs here, we enjoy chips by the bag just as much as anyone else but this recipe calls for a different setting. Now for some tips on the cooking. Use a firm type of potato with low starch. For frying I use a pot, if you own a deep frier it helps a lot. I don’t so I have to stick with the pot. Deep frying in a pot is dangerous, so take precautions before and make sure to don’t hurt yourself. A few tips on safety is to don’t fill the pot more than halfway with oil, the oil will rise when the potato are added and then it needs room to do so. Otherwise it can boil over and set your stove on fire. Use a thermometer to control the temperature. Keep some extra oil on the side, it can be used to lower the temperature of the oil. Also keep a lid for the pot nearby, in case of a fire put the lid on, never ever use water! Now let’s cook. Blend all the herbs with salt. It can be hard to mix such a small batch as in my recipe so make a bigger batch if you want to. The salt can be used for any other food. Make sure you use both fresh and dried herbs because otherwise the salt will get to moist and you won’t be able to salt the chips in a good way. Meaning the moisture from the salt will make the chips soggy and we don’t want that. You can use only fresh herbs but you have to make it a day or two in advance and then dry the salt for it to work. Wash the potatoes but keep the skin off, slice them as thin as you can, use a mandolin or a potato peeler to get this done easier. Rinse the potatoes in cold water to get rid of any extra starch. Remove the potatoes from the water and dry them on kitchen paper. Deep fry the slices on medium heat until golden, remove from the oil and immediately season with the herb salt. Combine sour cream and mayonnaise with the Sriracha and smoked paprika, adjust the amount of Sriracha depending on how hot you want it. Serve.